Every garden needs at least one tree, even if your plot’s the size of a postage stamp. Weirdly, trees make small spaces seem bigger, adding height and structure while taking up little space at ground level. Choose a manageably-sized tree with leaves that cast light, dappled shade rather than deepest gloom, and you can plant right up to them, so you won’t lose garden space. Trees also encourage birds and wildlife, provide shade on hot days and are good for the environment. Whichever tree you choose, check its eventual height and spread and avoid anything that will tower over you and your neighbours. Thin columnar trees cast hardly any shadow; upright cherry ‘Amanogawa’ with beautiful pink blossom in spring, or golden yew, Taxus baccata ‘Standishii’ are great for small gardens, and ‘Joseph Rock’ (height 10m/30ft) is gorgeous, with pearlescent berries the colour of clotted cream, darkening to yellow-orange later. The leaves develop orange, red and purple tints in autumn before falling. Sorbus hupehensis is another great rowan, with beautiful white berries, flushed with pinky-purple (8m/25ft) but the smallest is Sorbus vilmorinii (5m/15ft), with delicate ferny leaves and red berries that fade to pink and then white as they age. 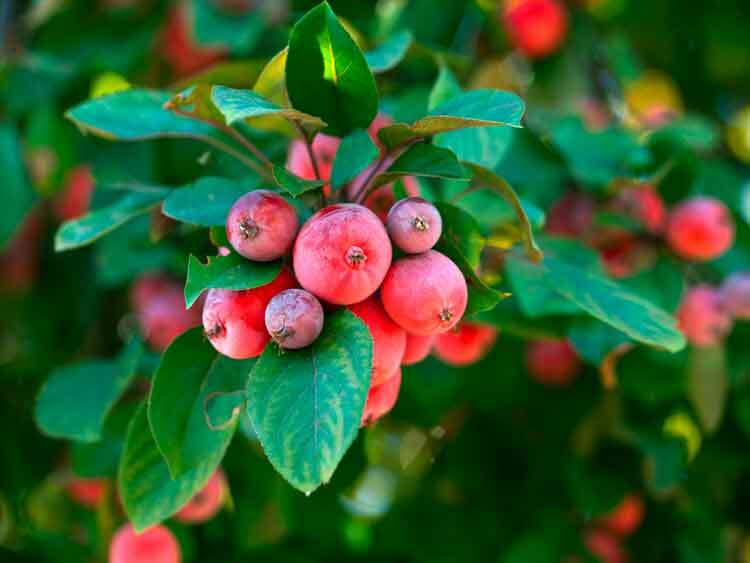 Crab apples are also an excellent choice with lots of interest during different seasons: beautiful blossom in spring and fruits in autumn (pictured above). ‘Golden Hornet’ (10m/30ft) has round yellow fruit. If you prefer red crabs, try the smaller ‘Red Sentinel’ (7m/22ft) or weeping ‘Red Jade’ (4m/12ft). Magnolia stellata is one of my favourite trees, reaching just 3m (10ft). It has stunning, floppy, star-shaped, pure white flowers in spring opening from large silky buds – they’re also lightly scented. If space really is limited, grow a tree in a container. Varieties of Acer palmatum are particularly suitable. ‘Sango-kaku’, with its flamingo pink branches and golden yellow leaves would be an excellent choice, or try blood-red, finely-dissected ‘Garnet’. A deciduous shrub or small tree with heart-shaped green leaves which turn yellow with the onset of autumn. This variety has wonderful dark purple foliage that develops stunning bonfire colours in the autumn.